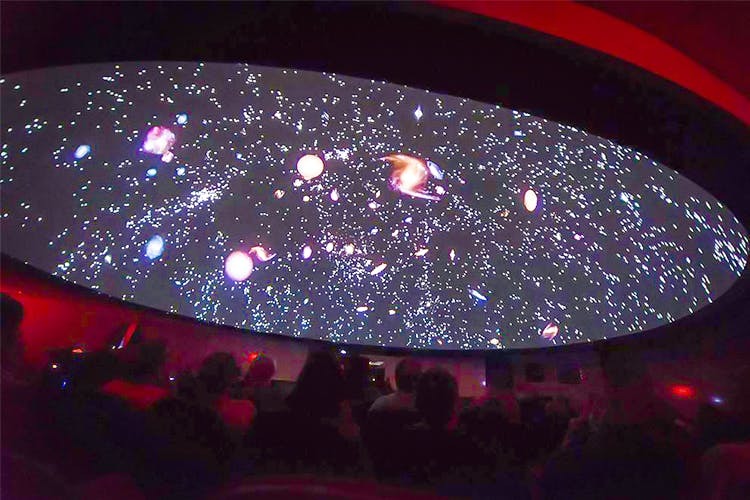 Starlit Sky & Comets: Have You Visited The Planetarium Yet? Fascinated with the night sky and the cosmos? Explore its secrets at Birla Planetarium in Adarsh Nagar where you can take kids for edutainment or your bae for an offbeat date. Located close to Birla Mandir, this planetarium is a part of the Birla Science Center, which also encompasses a science museum, an art gallery, and a dinosaurium. Science geeks, you’re gonna love it here! After you’re done exploring the artefacts at the science museum, which are interactive and exciting, especially for the little ones (hands-on exhibits based on simple laws of physics, optical illusions through mathematical puzzles, environment, and more can be studied here), proceed to the planetarium which has a dome, a 3D theatre and an observatory. Underneath the dome is a seating that can easily accommodate 70 people, and the show is presented in three languages — English, Hindi, and Telugu (at specific timings). Once the show begins, the exciting visual experience will engulf you in wonder. The 35-minute show titled An Incredible Voyage Through The Universe takes you on a journey through space and the history of astronomy. The presentation truly makes you think about the universe and your place in it. We know we reminisced the experience for a long time after we left the place, and oh kids couldn’t get enough of it. You can visit the dinosaurium to witness the 160-million-year old fossils of a dinosaur (Kotasaurus Yamanpalliensis) excavated in Telangana. So much at a single place, we can’t be more thrilled! Recognised as one of the best planetariums in the world, Birla Planetarium also has an observatory where you can gawk at stars and constellations through a telescope. Let us warn you though, that this place is often crowded, and getting tickets may be tough at the last moment; so get here some time in advance and for a mere INR 100, enjoy an experience that you and your little ones (kids above 4 years) will cherish.